Custom boots can be used to manage a number of foot imbalances associated with digital amputation and ligament and tendon injuries involving the paw. They can be used for cases where a neurological deficit is limiting a dog's ability to properly place their foot, and can offer the benefits of both positioning and protection. A custom boot can also be used in cases of leg length discrepancy, where the limb length can be made equal by the addition of a thicker sole. 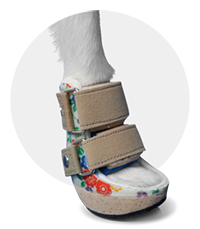 In place of fully custom boots, modifications to certain types of "off-the-shelf" dog boots can be done to make them more useful in managing foot placement issues. Straps can be made more substantial to help keep the boots in place, and cuffs placed over the hock and connected by a strap to the toe of the boot can offer some assistance in clearing the ground.